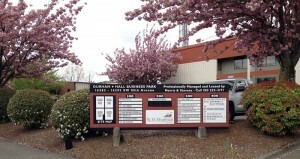 The Durham-Hall Business Center is located in Tigard, Oregon, a southwestern suburb just minutes from Portland. Positioned strategically between I-5 and 99-W near the intersection of Durham and Hall, this business center provides flexible office and warehouse space for both established and business start-ups supporting the metropolitan Portland region and markets beyond. The business center is part of a community that strives to blend modern city living with the friendliness and spirit of a small town. It is surrounded by well-maintained municipal properties including Tigard High School. Attractive tilt up concrete buildings make up the well-maintained and well-managed center. Suites range in size from 1200 to 2100 square feet and feature 18 foot high ceilings. The buildings have large roll up rear doors, making pick up and delivery of products and equipment, easy. Generally, 10 percent of each suite is built as office space, the remainder is warehouse and/or shop space. Business center tenants include commercial kitchens, auto repair facilities and machine shops, equipment manufacturers, construction companies, service contractors for the Oregon Department of Transportation, a soccer club headquarters, and a wine club.